The voice was as cools the night. Each turned around - he looked more amused than afraid. 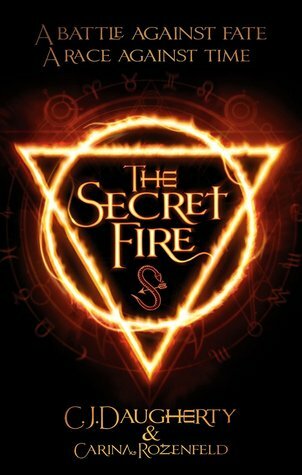 Ever since I heard CJ Daugherty talking about The Secret Fire at YALC, I've wanted to read it. I really enjoyed reading her Night School series, even though I'm still a bit behind in it. So I knew this would be as dynamic and fast paced as Night School is. I was intrigued by the prospect of reading a book written by a duo as it isn't something I read that often, but does appear to be becoming more popular in YA and MG fiction. I love that we are thrown into the action from the first scene where we find Sacha being told to jump off something that sounds extremely high. All I could think of was that the main character was about to peg it in the first paragraph! But no, the authors are playing with us and we are swept up into a dramatic chase that keeps us running all the way through the book as we jump effortlessly from France to England and back again. I'm guessing that Carina wrote Sacha's POV and CJ wrote Taylor's, but I could be horribly wrong. As a writing team, they have created an action packed book, where their voices blend seemlessly and beautifully together. I really think this series will appeal to readers who have grown up loving Harry Potter. It has that dark magical feel to it, only more contemporary and more dangerous. The book ends on a pause in the drama, where we know the characters will soon be back to deal with the disasters that are in their not too distant future. I loved the relationship between Sacha and Taylor. By rights, they should hate each other, but their attraction to each other sets the pages alight. I honestly can't wait for Book 2!!! I need to know what happens next. An excellent writing team, creating a screen worthy series.